For better or worse, many low- and middle- income countries inherited vertical programs in which programming, financing, governance, and service delivery are all organized around an individual disease. Governments must now decide whether a new government-managed financing scheme such as national or social health insurance will assume the functions currently performed through vertical programs. Specifically, governments may decide that services previously purchased through vertical programs will be either i) incorporated under the consolidated purchasing structure of the new financing scheme; ii) excluded from the new scheme and continue to be purchased by vertical programs; or iii) purchased through both institutional structures. To support governments facing these decisions, the Health Finance and Governance (HFG) project conducted this study to help health system stakeholders better understand why some LMIC governments have made the decision to integrate services into the purchasing mechanism of a new health financing scheme, and how they have operationalized it. 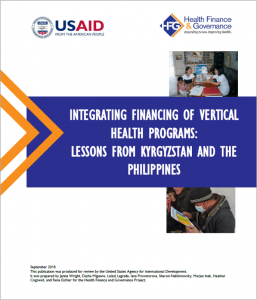 To explore these questions, HFG conducted case studies in two countries, Kyrgyzstan and the Philippines, where governments have been implementing large-scale and broad-based health financing schemes for more than a decade and have grappled with the policy and operational challenges. The case studies focus on the fate of single vertical programs: TB in Kyrgyzstan and FP in the Philippines.